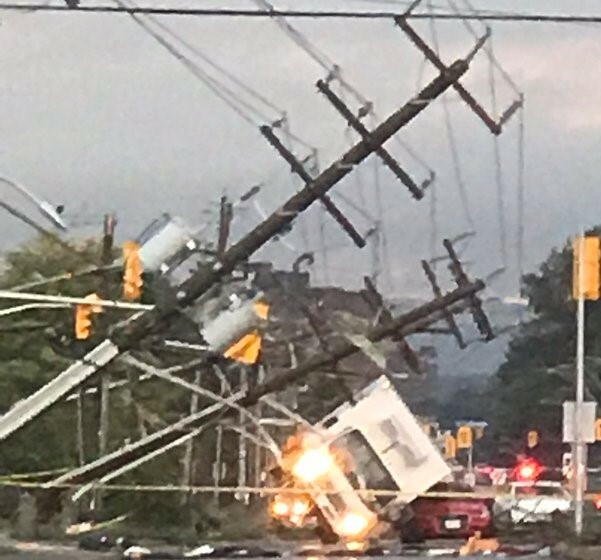 This was the scene that greeted us as we travelled North on Greenbank towards the Ottawa Pinball Arcade on Friday, September 21st, just after the second confirmed Tornado touched down in West Ottawa. Mere blocks from the Arcade and the elderly Family Members we were on the way to check in on after the Storm. Having just passed through this very intersection less than an hour earlier after installing a freshly restored Bally Supersonic and tidying up the games for the weekend crowd, nothing could have prepared us for what we witnessed after what only seemed to be a heavy Thunderstorm in the Manotick area. With every traffic light down from South and West of Ottawa through Downtown and Gatineau, the City was gridlocked, and what should have taken minutes took hours. It was not until we came to this very scene that we realized the extent of the damage. and realized this was not a “blip” in the grid. After turning back and detouring via Hunt Club to the 416, we saw a similar scene, with Hydro trucks blocking the road on Cedarview due to felled lines as far as we could see. Once travelling North on the 416, we saw again the telltale sign of a Tornado’s path of destruction, which ultimately continued to the Merivale Power Station where it unleashed it’s fury on one of two main supply stations for the entire City, crippling the power grid and leaving close to 300,000 homes and businesses in the dark, many for several days. We are thankful that no one was killed, and extend our best wishes for a speedy and full recovery to all injured or affected by this disaster. We apologise for not being open over the weekend due to the outage, and are back to regular hours, from 11:00 am to 11:00 pm every day. Wednesday Night FREE PLAY is also going forward this week as regularly scheduled.